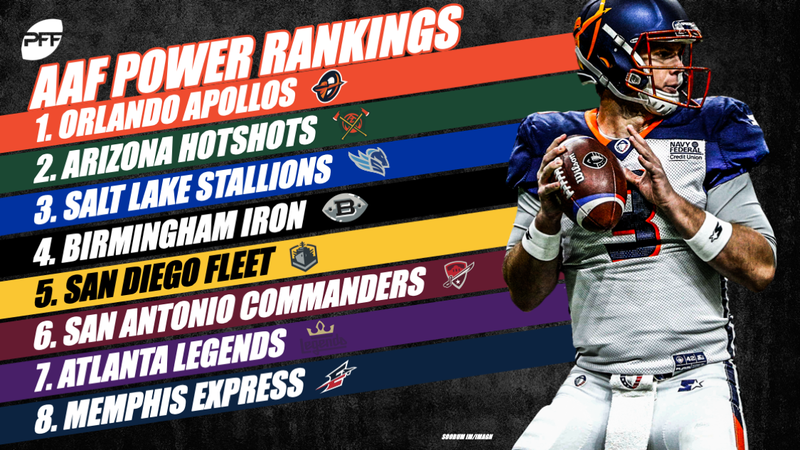 Last week we debuted these rankings, and while we got some flack for having Salt Lake fourth despite an 0-2 start, they became the first team in AAF history to win outright as an underdog by beating the previously first-place Arizona Hotshots 23-15 at home. This outcome was even predicted on the weekly PFF Forecast podcast, through the clear annoyance of @PFF_George. A lot of what goes into this algorithm is the preseason odds to win the AAF (via MyBookie.ag), but the results of the first three games for each team are weighed in considerably. We cannot promise that the inputs today will be the same inputs later in the season, given the nature of having only eight games to go off of, but we will be transparent about our process as always. Please tweet at @PFF_Eric and @BenjaminBrown22 if you have any questions about this rankings today or moving forward. While we’re likely a few weeks away from having a definitive guide to handicapping the AAF, there have been some notable outcomes market-wise through two weeks. First, favorites are 11-1 straight up and 8-4 against the spread. Unders (even though totals moved down about a touchdown from week 1 to week 2) are 9-3, as are home teams straight up. With Arizona losing Saturday in Salt Lake, the Apollos leaped into our No. 1 spot, winning at home against Memphis as 16.5-point favorites. Garrett Gilbert has been protected very well this season, especially by his two guards, Tre Jackson (81.1 pass-blocking grade) and Andrew Tiller (81.6). Those two interior linemen have allowed only five pressures total through three games, and in a league where defensive talent is outpacing offensive talent, Gilbert’s 34.4% pressure rate would be roughly league average at the NFL level. This has been a critical element in allowing Orlando’s signal caller to generate over 10 yards per pass attempt, the only passer in the league to have achieved that feat through three games. After losing in Salt Lake, the Hotshots are now No. 2 in our rating system (they were the odds-on favorite to win the AAF going into the year). It’s actually pretty difficult to glean much information from either Salt Lake/Arizona game since the losing team’s starting quarterback bowed out of each game around halftime. Among quarterbacks that have played in all three games, Arizona’s John Wolford has been the highest graded as a passer (78.6), with a league-leading seven touchdowns through the air and over eight yards per pass attempt. Getting quarterback Josh Woodrum back was key Saturday against the Hotshots, but the continued excellence of the defense, led by edge Karter Schult, who has generated four sacks, six hits and nine hurries in 95 pass-rushes, good for a top-10 pass-rushing productivity rate among all defensive linemen. After struggling the first week to stop Arizona, they’ve allowed just 27 points the last two weeks and are now our second-highest graded defense with a 78.3 overall grade (only 0.1 behind Birmingham). It will be interesting to see what they are lined at against the mighty Orlando Apollos next Saturday at home as they try to get back to 0.500. The Iron are one of two unbeaten teams left in The Alliance, based on a defense that currently ranks atop the league in our grades (78.4) and a quarterback in Luis Perez that has played well despite some of the worst support in the league (10 drops, a league high). They’ve also gotten some good goalline work from former NFL third-overall pick, Trent Richardson, who has otherwise been one of the least-efficient backs in the entire league, averaging just 2.5 yards per carry through the league’s first three weeks. The silver lining in this statistic is that Richardson is averaging 2.64 yards per carry after contact, but that is good for only 15th in the league. For the Iron to continue their hot streak, they’ll have to be more efficient on early downs passing the ball and continue playing league-best defense. The first will likely be easier to achieve than the latter. PFFleet put together their best performance to date sliding up to No. 5 in our rankings after their dominant win over San Antonio. Mike Martz turned back the clock to his glory days making Philip Nelson look nearly unbeatable in Week 3. Damontre Moore has 20 recorded pressures on 87 pass-rush snaps and should receive a call back to the NFL if he continues to perform at this elite level. The Fleet should be touchdown favorites on the road vs Memphis which gives us some pause with the change at quarterback for the Express. Outside of an early successful deep shot to Mekale McKay, Logan Woodside struggled mightily to move the Commanders offense in Week 3. San Antonio has four of the top 10 highest-graded wide receivers to start the season and Woodside has also experienced pressure at the second lowest rate in the AAF. The problem with this offense appears to fall squarely on Woodside as San Antonio has talent throughout the roster and has graded well at many positions. Unless Woodside takes a significant step forward, the Commanders will continue to find themselves in the bottom half of the AAF despite the talent that exists on their roster. The only thing worse than being 0-3, is also being 0-3 against the spread. Not a lot has gone right for the Legends other than standout left tackle Avery Gennesy who made our PFF Team of the Week for the second straight week. Through three weeks, Atlanta has the worst passing grade in the AAF with only Christian Hackenberg (44.9) standing between Matt Simms (51.4) and the worst individual passing grade. Simms checking down has been surprisingly effective, however, with Akrum Wadley posting a perfect reception percentage alongside 10.2 yards after the catch per reception. It took an 0-3 start but it is officially Zach Mettenberger season in Memphis. Mettenberger looked the part Saturday with a 79.1 passing grade behind 10 yards per attempt. With his competent college grades at LSU and brief NFL stint, most are rightfully questioning why he wasn’t starting over Hack to begin the season. Memphis should be a trendy home dog this weekend once we finally get lines for Week 4 AAF action.